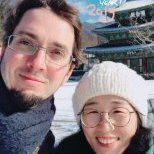 Hi everyone, I wanted to make this as a repository for info and questions on Korea procedures. Ok, I do have some questions of my own, now that our application is about to move over to Seoul from the NVC. 1. Has anyone used Electronic Funds Transfer in Korea yet? Is the system well-integrated with the interview scheduling site? 2. For the "Marriage Relation Certificate," it is unclear if this is necessary to bring regardless of marital status. I assume it is. Where do we obtain this? (You can see this mentioned under the Divorce Decree or Spouse's Death Certificate section of the document list). 4. In this forum, there have been mixed reports on the success of obtaining the proper police certificate (실효된 형 등 포함). Are there any updates on this? Several people suggest needing to go Anguk police station, near Insadong. My fiancé lives a long way from Seoul, so I hope to avoid this. 5. Lastly, now that I have my case number from the NVC, can we schedule the medical, do the DS-160, AND schedule the interview? I'm pretty clear that the first two are possible, but I'm unsure about the interview itself. Is there anyone with experience on this? We don't expect the packet to arrive to Seoul embassy until April 5-8. 1. We didn't use the ETF so I can't speak to this but we paid in cash at a Citibank branch and it took almost a whole day for the payment to process. The payment needs to be processed in order to schedule the interview. 2. The "Marriage Relation Certificate" is only necessary if the petitioner was previously married. 3. These documents are available at the Family Court. 4. My fiance got her police certificate in Busan. Just double check and make sure it is the correct form. She didn't have to go all the way to Seoul. 5. You can only do the DS-160 at this point as far as I know. Once you get the cover letter from the embassy (Packet 3), you can then pay the fee, schedule the interview and schedule the medical exam. You might be able to do the medical but the instructions say to bring a copy of the letter with you to the appointment. The letter only has the applicant's name and the case number so it might be fine as long as you have the number. Thanks RichMichelle. I'll give some updates now, first about DS-160. - we had trouble logging in with Chrome, so we used Firefox. - she doesn't know if her father is alive or dead, or where he lives, so we had to research to put Yes (alive) and UNKNOWN for address. - Several times, the connection ran out of time, and we had to type everything again on that screen. Make sure to save a lot! - For the question "Did anyone help you prepare it?" We put NO. First, she was able to read the questions herself, and second, I'm not an official helper. That's about it. Otherwise, it just takes a long time. I'll comment on other parts of document collection next. NVC sent our packet to Seoul on Tuesday April 2. There was a mistake and the packet went to Puerto Rico, but it arrived to Seoul on Monday April 8. The embassy sent me (Sponsor) the Packet 3 email on Friday April 12. I had to forward the email to Seunghyean. This email only had links. We got the documents at https://kr.usembassy.gov/visas/immigrant-visas/packet3-k/ This is actual link they sent me. I have seen several people who scheduled the interview before they received Packet 3, but the embassy discourages this and told us "please wait until you receive the email." So we waited. But now, the next interview date is June 12. We will try to find a closer interview. Seunghyean will call tomorrow (Monday). I post a document update, below. Here are the main documents Seunghyean had to collect. The Korean embassy information is very good. I will make some comments on some of the documents. DS-160 Confirmation Page: See my previous posting. Police Certificate: We found that there is a new option for the police certificate that many older websites don't mention. At the national police station, there is a short paper application form. You can request "For permission of foreign country immigration and stay". If you really want to be careful, just make sure that it will include Criminal Records and also 실효된 형 등 포함 which is Lapsed Records. I will post a photo of our results, below. 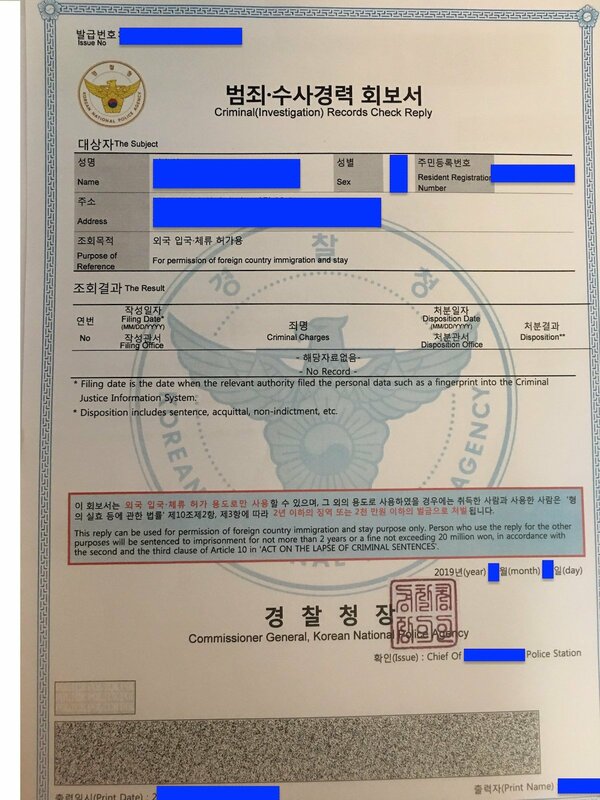 Basic Birth Certificate (기본증명서) and Family Relation Certificate (가족관계증명서) with English translation: Very simple to get, from the Family Court. 7 new passport-style photos (2"x2" or 50mmx50mm): Don't wear glasses. 5 for medical, 2 for Visa interview. Medical Exam: We haven't done this yet, but I *think* you have to schedule your Visa interview, then you can get the medical appointment. Visa Interview: We haven't scheduled yet, but here is the website. Be careful because now you have to choose Immigrant Visa for this step if you are K-1. Here is a picture of our Police Certificate. Very straightforward actually. Note that the Purpose of Reference says "For permission of foreign country immigration and stay." Evidence of on-going relationship: bank statements, photos, flight ticket, AirBnB reservation, emails, texts, phone calls, gifts). I even did a Vimeo videos page. It was over-prepared, but that's my style. I recommend people to use tax transcripts, because it condenses a 20 page tax return into 3 pages. They can be found at: https://www.irs.gov/individuals/get-transcript If the electronic verification works, you can get them instantly. Otherwise, you will have to wait 2 weeks for a letter giving you an access code for the e-transcripts. Or, you can just request a paper copy. Ok I think that's my last post for a while. Good luck all!